The identification of potential sites for plasticity in the VOR has thus far been limited mainly to the investigation of very specific signal components that are modified following a particular reflex-training paradigm (i.e., broadband reflex training). Yet, the richness of different behavioral observations associated with different training paradigms points to the existence of multiple potential adaptation sites within the VOR pathways and the use of different adaptation strategies that thus far remain virtually unexplored. Although the ability to explicitly localize sites for plasticity to individual cells is currently limited by incomplete knowledge of network structure, the use of innovative analysis and modeling approaches that are less sensitive to a priori assumptions can aid in conceptualizing such strategies and in identifying additional sites for plasticity. At the present time, therefore, an apparent step back toward more process-oriented models and interpretation may be required to make further progress in identifying sites for plasticity at the level of individual neurons. Hence, despite much progress in identifying the neural correlates for motor learning in the VOR, the story is far from complete. 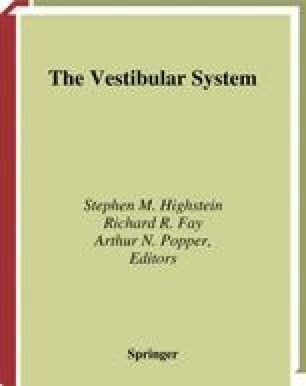 The VOR system remains an excellent model system for the investigation of the neural correlates for motor learning and in particular for investigating learning strategies that are context-dependent.